A project's Tags view contains the tag tree, which is a visual display of its tag dictionary. All projects in Smartvid.io come with a set of suggested popular tags; read on to learn how to navigate the tag tree and customize it to suit each project's needs. The parent-child structure helps organize tags into categories that make sense to you and your team as you start to create and use many different kinds of tags. When you search for a tag, you can also search for all of its child tags. For example, search for tag Floor 1 "with descendants" to find all children tags under Floor 1, including Room 101, 102, 103 etc. 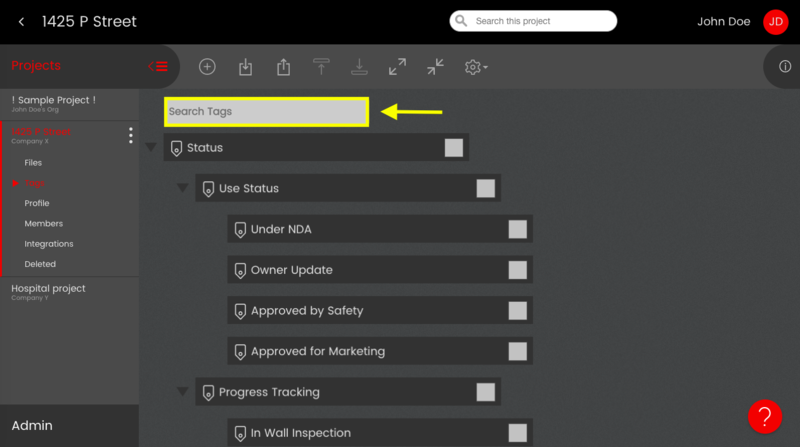 It can help you organize tags into categories that make sense for you and your team as you create and edit tag definitions. In the Tag title field, type the tag's name. Select/unselect checkboxes to turn each of the 3 types of tagging on/off (all 3 are on by default). Tag alternates - tag alternates can be a very useful way to use multiple names for the same thing. If you add a word/phrase as an alternate to a tag, the tagging engine will register any instances of it as instances of the main tag. Why? 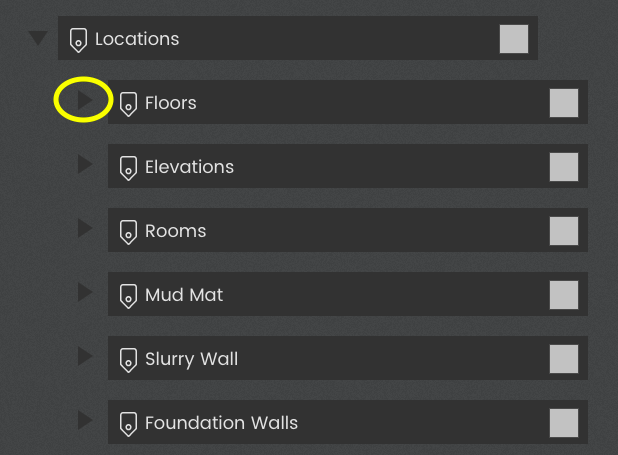 Speech tags: It's common for people to refer to the same location in different ways, like as Level 1 and Floor One, which can get in the way of using locations for progress tracking. To solve for this, create a tag Lever 1 and add Floor One and First floor as alternates. 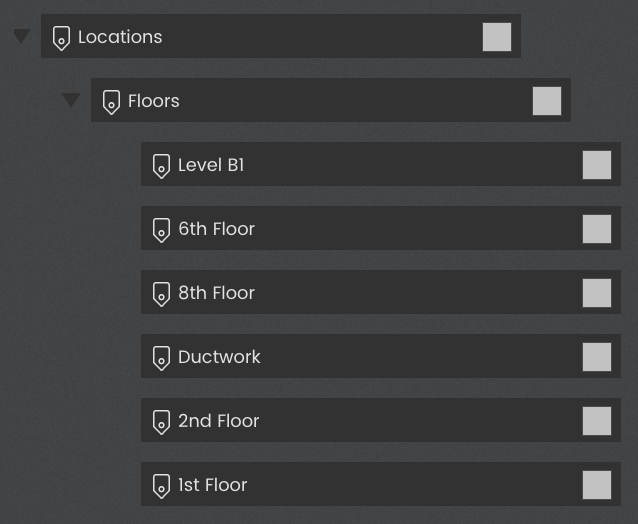 Then if our speech engine hears First floor or Floor One in a video, it will add an instance of the Level 1 tag. To add an alternate word or phrase to the tag, type it in Other alternatives to match this tag and click the + icon to the right to save. Repeat for any other alternates you want to add. Click Add Tag to save the new tag. The Add Tag pop-up will appear, but the tag definition you create it with it will be saved as a child tag to the original tag. Follow the same steps for as creating a parent tag to choose tagging behaviors and add alternates. Click the Add Tag button to save. Type in the Tag title field to edit the tag's name. 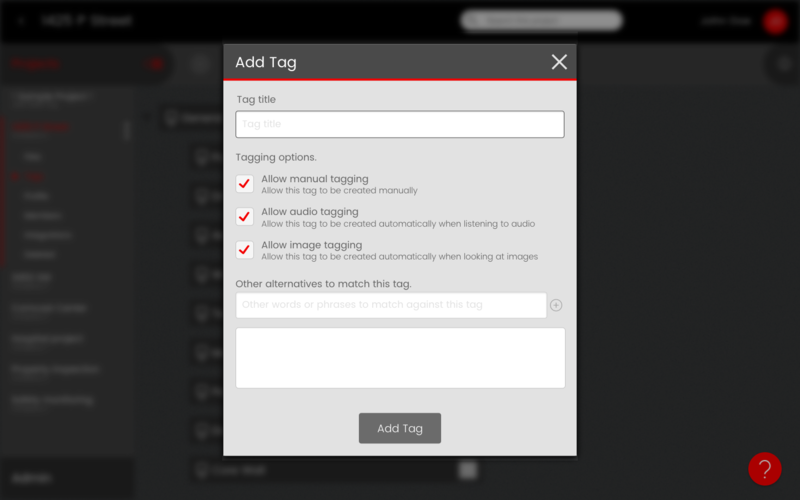 Use the Tagging options checkboxes to turn each of the 3 tagging behaviors on/off. Exiting tag alternates will be listed below the Other alternatives field. Use the ‘x’ to the right of each alternate to remove it. Click Update Tag to save changes. To expand or collapse the display of a single tag, click the dark grey arrow to its left to toggle between expanded and collapsed views. 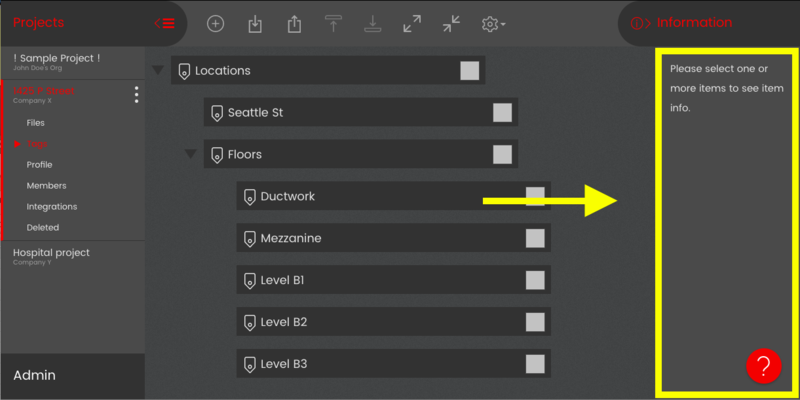 To expand/collapse multiple tags at once, select them using checkboxes and click the expand or collapse icons. If you click either with no tag selected, the entire tree will be expanded or collapsed. Promote and demote tags to change their hierarchy in the tag tree. Demoting a tag makes it the child tag of the preceding tag in the tree. To demote one or more tags, select tags using their checkboxes and click the Demote taskbar icon shown above. We offer a Microsoft Excel (.xlsx) spreadsheet template that can be used to edit tag definitions in bulk. 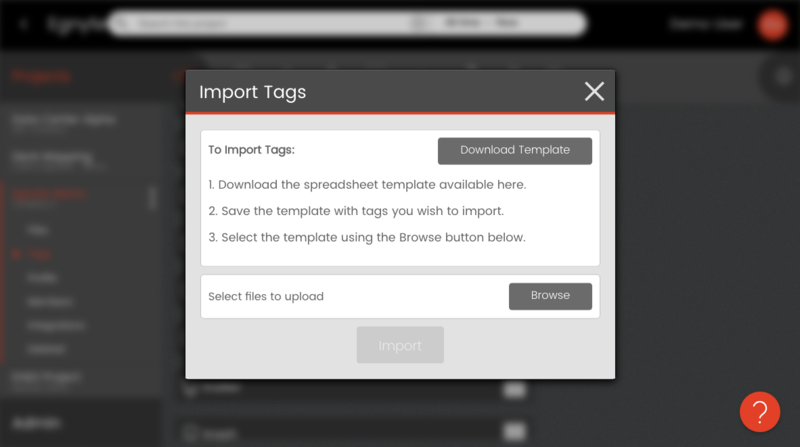 Click here to download the tag import template, or download it in-app by following the instructions below. Enter name of tag definition. Enter another tag to define this row’s tag as its child. Enter TRUE to enable manual tags, or FALSE to disable. Enter TRUE to enable speech tags, or FALSE to disable. 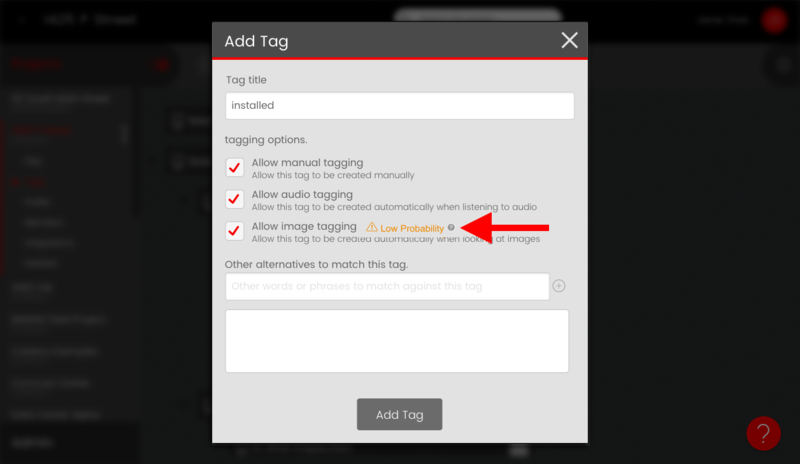 Enter TRUE to enable image tags or FALSE to disable. Enter an alternate tag. Enter a second alternate tag.. Enter a third alternat tag. QuickTip: The Parent Tag Title and all 3 Alternate/Alias columns are optional, but all other columns are required. If you leave any of them blank, the tag in that row won't be imported! 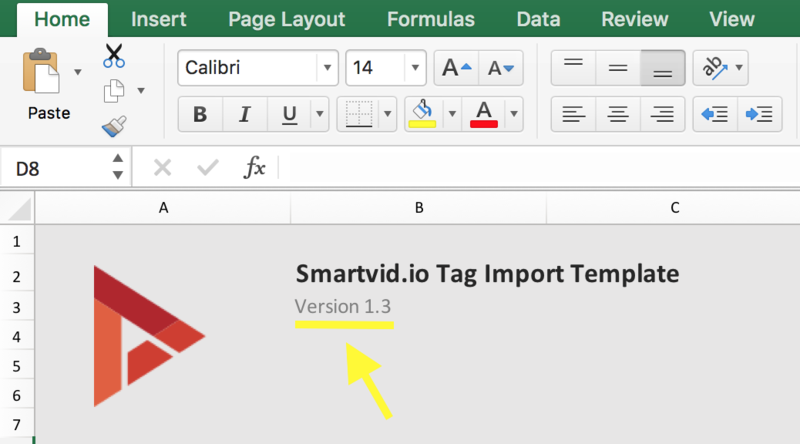 If you want to use the template to edit existing tags, you should export your current tag dictionary to the template, make edits (and add new rows for any new definitions), save and import. Your changes will override the former tag properties saved in the app. Click the Browse button to select and upload the filled out import template from your computer. Click the Import button to upload your attached spreadsheet. Wait for a pop-up confirming your tags imported successfully. If one or more of the tag titles or alternates you entered in the template already exists, the pop-up will say "Tag Import Failed". Clicking View Report will show you the tags that returned errors. You will need to edit these tag names in your template, or delete the existing duplicate tags from the tree, before you can successfully re-import. If you do, you'll get an error that you're not using the correct version of the template. You can use the Export icon to export all tags in project's dictionary to template form. This can be useful if you need to bulk-edit the properties of several tags at once, or for copying tag definitions to another project. Click Download to save the exported .xlsx file to your computer's Downloads folder. To make changes to tag names, settings or alternates or the parent/child structure, just edit the exported spreadsheet, save it with with your changes, then re-import to the project. Your edits will override the previously saved tag definitions. You can also use the template to bulk-copy some or all of the exported tags to another project, without having to recreate each one manually. Open the exported file and delete the rows of any tags you don't want carried over. Save any edits to your computer, then re-import the spreadsheet into the other project's Tags view. Use the Info Panel to view information and data about a specific tag. Click on the Times found link to see all project files with the tag (same as searching the project for the tag). Deleting a tag removes it and all of its child tags from the tag dictionary. It will also remove all instances of the tag found on project files. Click Delete again on the pop-up warning to confirm. Smarvid.io is powered by image & speech recognition software that can recognize almost any word in English speech, as well hundreds of visual objects related to construction. 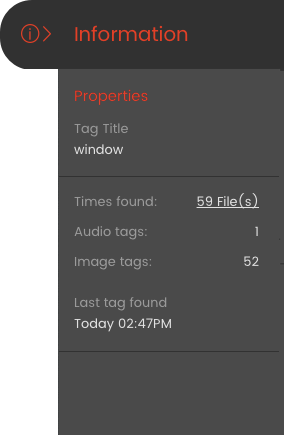 When we analyze photo & videos, we instantly add tags to them based on what our software sees and hears. Speech tags - We add speech tags to videos when we think we hear the tagged word or phrase in the accompanying audio tag. For example, if you upload a video where the word "bridge" is said 3 times, our tagging engine will place three Bridge tags at each place where it's said. Manual tags - Manual tags are tags added by you or other users. 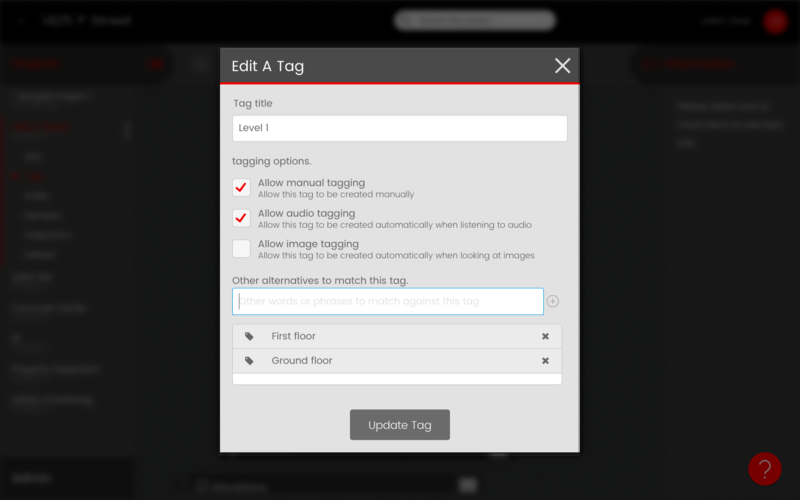 You can add an existing tag as a manual tag, or you can create a new tag as you add it manually. What is a tag dictionary? Tags are the primary method of classification and organization within a Smartvid project. Each project has its own tag dictionary which graphically stores and organizes all the tags in a given project. Smart tagging will only recognize tags that you have added to your tag dictionary. The tag dictionary is the set of tags you decide to use on a project - think of it as your project "punchlist." Since our image & speech recognition is so broad, each project has its own tag dictionary to let you constrict it by deciding which tags are useful for a specific project's needs. For example, say you upload a video where the word “crane” is said to Project X. If you have Crane saved in Project X's dictionary, the video will get a Crane tag. But if you don't have it is in the dictionary, it will ignore it and move on to the next word it hears. In the next tutorials, you'll learn how to create projects and use the Tags view to set up each project's dictionary. When you create a new project, we automatically add a set of of popular tags to the dictionary to help you get started with; you can and should delete the default tags you don't want to use and add your own, or else the files you upload will be automatically tagged with things that may seem random and irrelevant to you. Once you've done that, start uploading or set up an integration to start finding tags and getting the most out of your photos & videos!